CAMPUS LIFE | Early in the spring semester, a student group called NoNames for Justice launched a protest demanding that the university administration take stronger action on race-related issues, improve diversity courses and training for faculty and staff, and change the name of a campus building named for an individual linked to the Vermont eugenics movement of the 1930s. Student actions included blocking Main Street for several hours beginning at 5 p.m. on February 22, staging a rally during an Admitted Student Day event in the Davis Center on February 23 and an afternoon and evening sit-in at the Waterman Building on February 26. John Mejia, assistant director of the Office of Student and Community Relations at UVM, went on a five-day hunger strike in solidarity with the students. 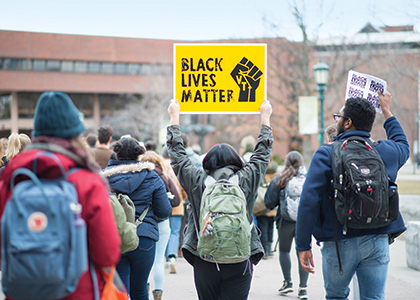 President Tom Sullivan, Board of Trustees Chair David Daigle ’89, Vice President Wanda Heading-Grant ’87 G’03, and Vice Provost Annie Stevens, were among the UVM leaders who met with the students to address the issues. The president’s letter identified six action steps to improve the quality of diversity courses, build a more diverse faculty, and enhance faculty-wide professional development in diversity and cultural competency. In March, the Board of Trustees established a Renaming Advisory Committee, charged with evaluating proposals to remove a name from a building, academic unit, or academic program. The process draws from renaming principles and criteria developed and adopted by Yale University in 2016. Board Vice Chair Ron Lumbra ’83 chairs the advising committee of trustees and faculty. A proposal to remove Guy Bailey’s name from Bailey/Howe Library is currently under consideration by the committee. Bailey, president of UVM from 1920 to 1940, served on Vermont’s Eugenics Advisory Committee and supported eugenics research at the university.